We have been warned about the psychological perils of technology: distraction, difficulty empathizing, and loss of the ability (or desire) to carry on a conversation. But our devices and data are woven into our lives. We can't simply reject them. Instead, Margaret Morris argues, we need to adapt technology creatively to our needs and values. In Left to Our Own Devices, Morris offers examples of individuals applying technologies in unexpected ways--uses that go beyond those intended by developers and designers. 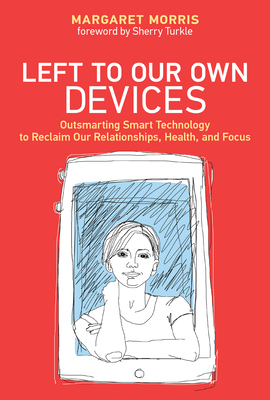 Morris examines these kinds of personalized life hacks, chronicling the ways that people have adapted technology to strengthen social connection, enhance well-being, and affirm identity. Morris, a clinical psychologist and app creator, shows how people really use technology, drawing on interviews she has conducted as well as computer science and psychology research. She describes how a couple used smart lights to work through conflict; how a woman persuaded herself to eat healthier foods when her photographs of salads garnered "likes" on social media; how a trans woman celebrated her transition with selfies; and how, through augmented reality, a woman changed the way she saw her cancer and herself. These and the many other "off-label" adaptations described by Morris cast technology not just as a temptation that we struggle to resist but as a potential ally as we try to take care of ourselves and others. The stories Morris tells invite us to be more intentional and creative when left to our own devices.